22 Words has a fun piece that identifies 6 prominent pieces of pop propelled by unusual time signatures, the most famous likely being Pink Floyd’s “Money,” whose opening bass line is played in 7/4 time. Interesting to see how many YouTube audio clips there are of “Love Is Only Sleeping” as recorded by The Monkees – at least twenty, almost certainly more – but all of them with relatively low viewership numbers (in the hundreds and low thousands). Clearly, there are still vast stretches of the world’s population that appear to be wholly unfamiliar with this classic Barry Mann-Cynthia Weil composition. Wikipedia reports that “Love Is Only Sleeping” was only added belatedly to groundbreaking 1967 album, Pisces, Aquarius, Capricorn & Jones, Ltd. when the song was pulled as the A-side of a single – its title deemed too risque, purportedly. “Daydream Believer” ended up as the new A-side, with “Goin’ Down” (ironically) being chosen for the flip side. Thus, you can try in vain, but Googling the phrase “Love Is Only Sleeping” will yield no images whatsoever of the forbidden 45. As with Johnny Cash’s “Five Minutes to Live,” we are left with the overwhelming heartbreak of an obvious A-side forever in search of a good home. 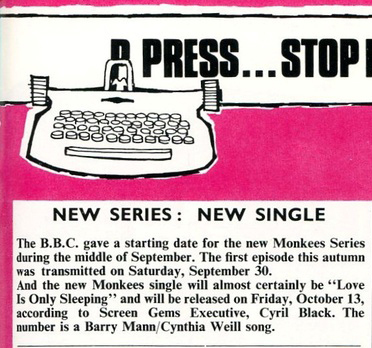 Various web sources assert pioneering synthesist, Micky Dolenz, as having played Moog on “Love Is Only Sleeping” – in addition to pop masterpiece, “Daily Nightly” – while iTunes states Mike Nesmith as producer of this once-banned A-side. 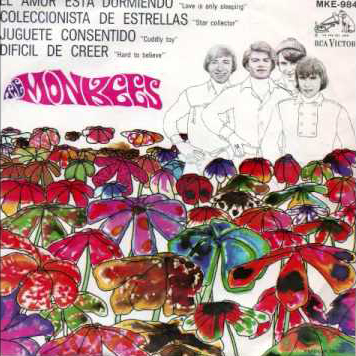 This entry was posted in "Love Is Only Sleeping", Banned Songs, The Monkees, Unusual Time Signatures in Pop by Zeroto180. Bookmark the permalink. MeTV has the Monkees series in rotation. Hopefully some of these great songs will be revived by those of us lived during that era and new fans. Yes Love is Only Sleeping and Daily Nightly are both fantastic songs. Working now on learning the intro and would love to purchase a 12-String Blonde Gretsch Guitar that Mike played.